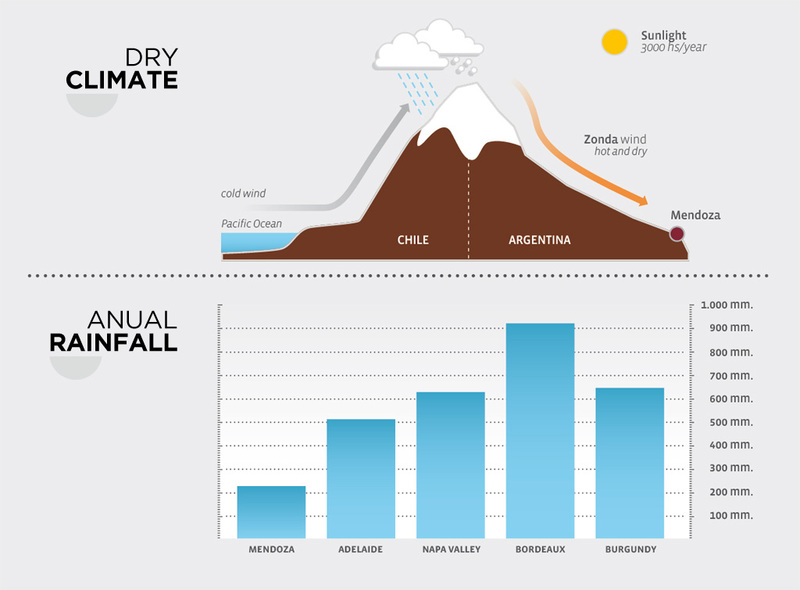 Argentine winemaking regions are often located in broad valleys or sloping plains and offer ideal conditions for grape growing. It should also be noted that most of our vineyards are located far from the cities and their pollution, and grow on young, scarcely tilled soils. Every detail makes Argentine wine unique, authentic, remarkable due to its intense colors, deep aromas and broad range of flavors. The fact that the Argentine wine regions develop amidst the aridity and dryness of our landscape leads us to refer to them as oases. These oases can be classified into regions and subregions. Some stand out for their altitude, such as the Calchaquíes Valleys, in the North; others for the aridity of the land, such as the valleys in the provinces of Mendoza, San Juan and La Rioja; and there are also low altitude oases in Patagonia, with intense ripening periods.